Really? There are THAT MANY diabetics in the Bangor, Maine area? It is possible, I suppose. And tragic. Being from New York City, syringes like that bespeak of heroin and crack addiction, loss, dirt, poverty, AIDS. This diabetes thing scares me. So, here’s a list of foods to eat daily that help regulate and stabilize blood sugar levels. If I were you, I would whirl them up in these: http://amzn.to/1utbLih It’s just really easy to drink your vegetables and may keep you away from the syringe box. The top 10 foods for blood sugar stabilization. You’ll also be less anxious and more even tempered too. 6. Tumeric – the yellow spice used in Indian cooking is a huge detoxifier. It has little flavor so use it. YOU NEED TO CLEAN YOUR BRAIN OUT. I DON’T MEAN DIRTY THOUGHTS. THOSE ARE ACTUALLY FINE ON A GREEN SMOOTHIE DIET. 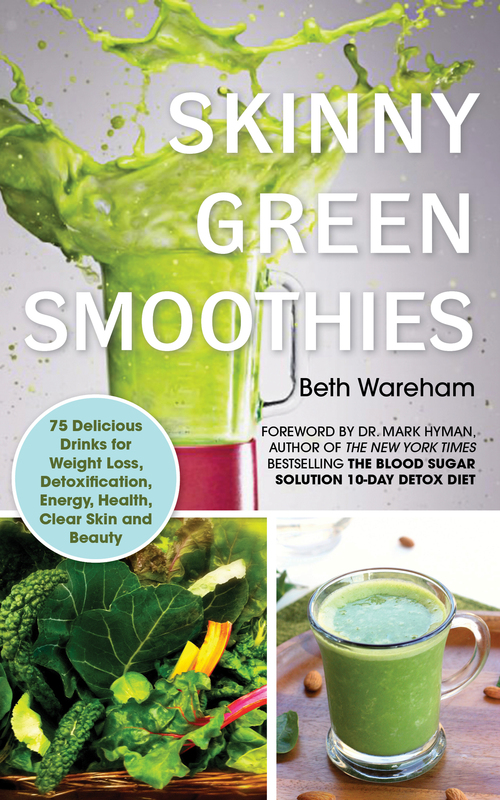 Sorry to keep thumping on the brain thing, but there’ another fact I learned from my health guru, Dr Mark Hyman – you can find him here at http://www.drmarkhyman.com. Toxins come in through your mouth and skin and move through your body in your blood. There is no blood barrier between your body and brain so all those heavy metals, pesticides, plastic molecules and pollution flow through that most important of all organs, your master control center. Like anything that grows dirty, you need to give it a good cleaning. That means detoxification. That means increased metabolism (weight loss) and elimination (peeing and pooping to the layman). Yeah. Flush that bad stuff out! The foods you need to be putting in your green smoothies with regularity are citrus fruits such as grapefruit, lemon and lime; herbs, especially cilantro and parsley, walnut pieces, beet greens, cabbage, kale, lemongrass, celery, ginger, green tea (a great base liquid) and turmeric. The more delicious the combinations of these foods you can whirl into a green smoothie, the easier it will be for you to stay interested in detox: It will taste good. The better the combinations, the more you will make, flushing your body out on a consistent basis. The more you flush out your body, the cleaner your brain will be. Thoughts may still be dirty, but those thoughts will be clear. Life is fast these days. You can’t afford an unfocused muddy mind. Drink green smoothies and go clear. 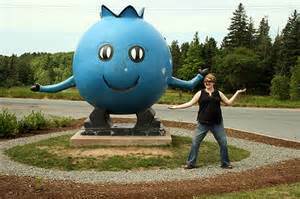 THIS IS KING BLUEBERRY. HE’S HOLDING THIS WOMAN’S HAND BECAUSE HE WANTS TO HELP HER. HE WANTS TO JUMP IN THE BLENDER JAR AND HELP FLUSH TOXINS OUT OF HER CELLS AND HELP HER LOSE WEIGHT. KING BLUEBERRY IS A GOOD KING. 1. PUT BLUEBERRIES, SPINACH, LEMON ZEST AND JUICE IN THE BLENDER. COVER WITH WATER AND BLEND UNTIL SMOOTH. 2. ADD THE HONEY, CHIA SEEDS AND CINNAMON AND BLEND, DROPPING ICE THROUGH THE TOP OF THE BLENDER AS IT WHIRLS. SERVE. So, yesterday we learned that Mr. Celery belongs in your green smoothies because of the way he assists with elimination, another word for pooping. Don’t just put him in juices: use celery in your thicker creations, the Skinny Green Smoothies. But an inquiring mind might ask “what else makes me poop?” One of the answers to that question is CHERRIES. Glorious red Bing cherries, pitted with love, and plopped into the blender will get your trains moving on time. Cherries are also rich in phytonutrients: Vibrant color means the fruit or vegetable has powerful abilities to clean out your cells and flush toxins from your body. That’s part of the pooping. Cleaning out cells keeps your body free of illnesses such as cancer and diabetes. That’s why you should always reach for color in the produce section. Makes shopping easier, no? Finally, cherries are full of melatonin and that helps you relax. Impossible, you say! No so. Because after you poop and the melatonin kicks in, you’ll be a lot more fun to be around. Why are Americans afraid of herbs? A sprig here, a garnish there. What’s the little deal? Why can’t we have more with our food? Cooks like the Barefoot Contessa and the much celebrated Herb Farm out West have been encouraging us to add bursting handfuls of fresh herbs to our foods forever. Few do it. I just don’t know why. My salads are about 1/2 lettuces and 1/2 herbs. Why? The flavor! So, the stuff pictured here. It’s cilantro. Say you REALLY love the flavor. You put 3 tablespoons of chopped cilantro leaves in your guacamole instead of two. You may feel the same about basil and sneak extra leaves between your mozzarella and tomato. You are a fresh herb sneaker. Stop the sneaking. It’s time to use huge bunches of fresh herbs as greens for green smoothie because they have SO MUCH NUTRITIONAL POWER IT IS MIND BOGGLING. 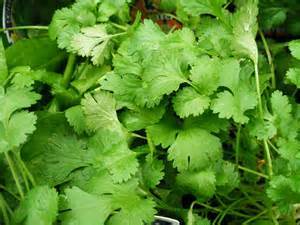 Cilantro literally sticks to and drags heavy metals from your body. Forget Obama Care. You need these. 1. Really scoop out the avocado – much of the best nutrients are under the skin – and add to the blender along with the cilantro, spinach, and lime juice. 2. Cover the ingredients in the blender with water, add the chia and honey, if using, and process until all the ingredients are broken down. 3. With the motor running, drop ice cubes down through the hole in the top of the blender until the desired cold and thickness is reached. 4. Pour. Feel heavy metals and toxins being dragged from your body as you sip. It feels GOOD.